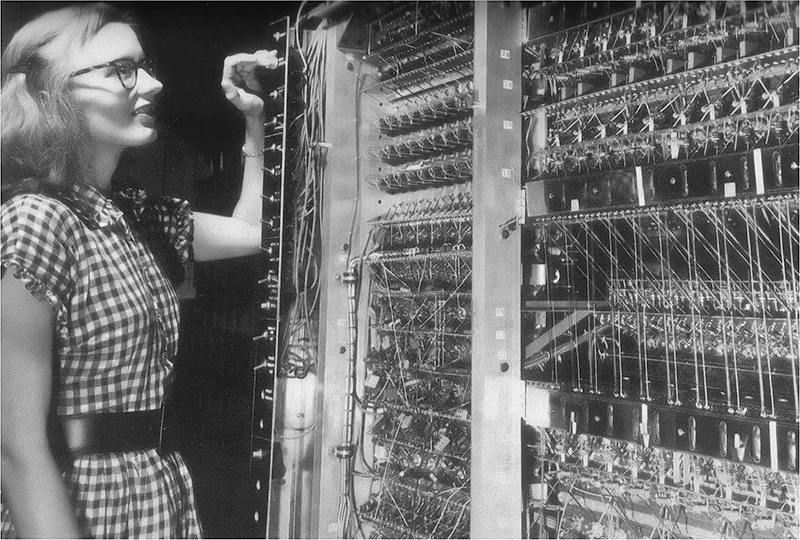 Control panel and plugboards of the British Colossus computer, 1944. It was not programmable, had 2500 vacuum tubes, and it had only one hardwired purpose and algorithm: to crack the encryption of Germany’s Enigma machines, processing up to 5000 characters per second. Based on the work of mathematicians and cryptographers such as Alan Turing at the top secret Bletchley Park facility, the ability to break German codes was one of the factors that eventually turned the Second World War in favour of the Allies. Another notable thing about this photograph is the strangely timeless/time traveller style of the woman on the left. I think she could walk down the street anywhere in the developed world at any time between about 1930 and 2030 and look like she belongs there.